Marjahn Goodman '14, an international affairs major from Richmond, Va., had the opportunity to live and study in Amman, Jordan, during the 2013 fall semester. She says immersion in that culture and language helped her become more confident and aware of her own identity. "At first, it was challenging to be in a new country with a language barrier and cultural differences," says Marjahn. "I had studied Arabic and was in the UMW Arabic language club, but it's different when you're actually living with a Jordanian family and none of them speak any English." With support from the Carlos and Carol Muldoon Martel '68 Scholarship for International Studies, a Benjamin A. Gilman International Scholarship from the U.S. Department of State, and guidance from the UMW Center for International Education  Marjahn was able to participate in a special program in Jordan with 50 other American students. "We met at AMIDEAST every day for classes and also visited each other's host families to learn more about the language and culture," she says. In addition to her classes, Marjahn served as an intern at the Jordanian Friends of the Environment Society, a non-profit organization specializing in raising environmental awareness among youth, the industrial sector, and in rural communities. She also helped conduct a census, created a social media platform, and translated materials for the Women's Empowerment for Solar Electrification of Rural Villages project (known as Solar Mamas). Overall, she says it was surprising to see the contrast in the way people lived. "I visited villages near the Iraqi border and saw people living in tents and shacks  some with electricity and some without," says Marjahn. "Then I would see areas with extravagant shopping centers selling Louis Vuitton® and Apple® products. Regardless of what people had, though, they were always giving and hospitable." As the first person in her family to graduate from college, Marjahn remains thankful for the financial support she received. "The entire study abroad program was very expensive, and I could not afford it on my own," she says. "I applied for several scholarships and was happy to receive two, including the UMW scholarship from the Martels." Marjahn met Carlos and Carol Martel at the annual Donor Appreciation Luncheon. "They're wonderful people," she says. "Mr. Martel told me about his childhood in Cuba, and Mrs. Martel told me her study abroad experience in Vienna and Freiburg during her junior year at Mary Washington changed her life. I'm very grateful I was the recipient of their scholarship." Carlos and Carol Muldoon Martel '68 funded their current named scholarship with an outright gift in 2008. 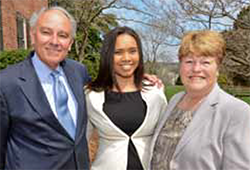 As members of the UMW Heritage Society, they have made estate plans to increase the amount of the scholarship endowment so more students like Marjahn can benefit from international studies. For more information about supporting scholarships or study abroad programs, contact the Office of Gift Planning at 540/654-2064 or jclarke@umw.edu.